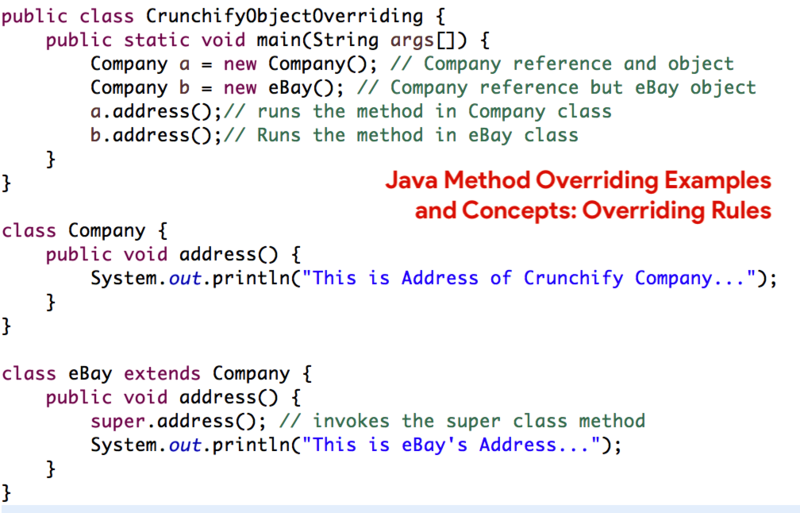 Last week I wrote Java Method Hiding and Overriding: Override Static Method in Java here. But I realized, it’s worth sharing some more information on Java Method Overriding. In java, a method can only be written in Subclass, not in same class. The access level cannot be more restrictive than the overridden method’s access level. For example: if the super class method is declared public then the over-ridding method in the sub class cannot be either private or protected. An overriding method can throw any uncheck exceptions, regardless of whether the overridden method throws exceptions or not. However the overriding method should not throw checked exceptions that are new or broader than the ones declared by the overridden method. The overriding method can throw narrower or fewer exceptions than the overridden method. In the above example you can see that the even though b is a type of Company it runs the move method in the eBay class. Reason: In compile time the check is made on the reference type. However in the runtime JVM figures out the object type and would run the method that belongs to that particular object. Therefore in the above example, the program will compile properly since Company class has the method move. Then at the runtime it runs the method specific for that object. When invoking a superclass version of an overridden method the super keyword is used.